On the Middlesbrough – Saltburn railway line, 700yd west of the present South Bank station; adjacent to Old Station Road (formerly Station Road) which has been extended and now crosses the railway and station site on an overbridge. Notes: In 1880 the new South Bank station was authorised, together with three cottages and a warehouse; the total cost was £7,703. The station name was sometimes rendered ‘Southbank’ until 1891. For three years it co-existed with the earlier South Bank station which reverted to its earlier name of Eston until it closed in 1885. By the late nineteenth century the Middlesbrough – Redcar route carried huge volumes of goods and mineral traffic, and the new South Bank station was built within a multiple track system as an island platform. Fawcett notes that this island layout at ‘wayside’ stations was largely confined in NER territory to lines which were new, or were being widened as at Heaton in Newcastle and on the York to Church Fenton route. The broad island platform’s southern (up) face was straight, but the northern face had a shallow curve. The station was reached from the south by a footbridge over the up track, towards the western end of the platform. The bridge was of iron, slightly arched, and originally roofed. Two sets of stairs led down eastwards towards the station building, whilst a single staircase led down to the west, which appears to have been replaced with a lift shaft early in the station’s life. A functional single-storey red brick building with a ridged slate roof contained all of the facilities, the booking office being at the western end close to the footbridge. Window and door openings had a segmental arch design. Generous partly glazed ridge-and-furrow awnings covered the platform faces and extended over much of the roof of the station building. The columns which supported the awnings had swelling Gothic bases but lacked ornamental capitals. The brackets included the Star of David motif which could be seen at some other NER 1880s stations, such as Heaton. 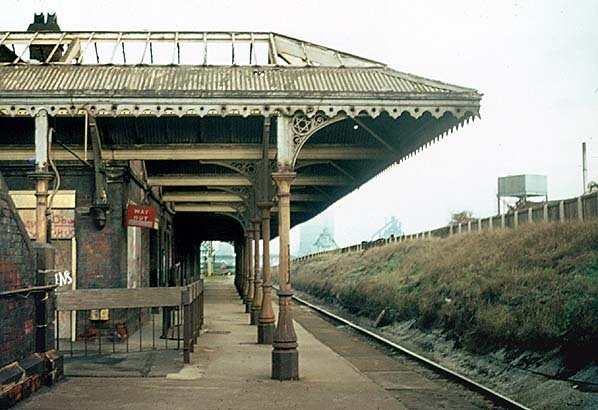 The awnings were more substantial than at the neighbouring Cargo Fleet and Grangetown stations, also built with island platforms, and opened three years later than South Bank. South Bank enjoyed a somewhat higher frequency of stopping trains than its neighbours Cargo Fleet and Grangetown. In summer 1896 South Bank had 16 down trains (towards Redcar) on Monday to Friday, 21 on Saturdays and four on Sundays. In the opposite direction 19 called on Monday to Friday, 22 on Saturdays and three on Sundays. In summer 1920 the services were a little more frequent. In 1911 the station issued 370,690 tickets, seven times the quantity of neighbouring Cargo Fleet; for comparison’s sake Middlesbrough issued a little short of a million tickets that year. The North Eastern Railway became part of the London & North Eastern Railway in the ‘Grouping’ of January 1923. The LNER enhanced the train service at South Bank and the neighbouring stations. In winter 1937-8 South Bank was favoured with an approximately half-hourly service, with more frequent calls in rush hours: in each direction 38 trains called on weekdays, with nine down and eight up calls on Sundays. Under LNER ownership electric lighting was installed in the station, with the company’s distinctive ‘mint imperial’ lampshades. These were suspended from the awnings or were held in hoop-topped posts on the open platform. As was also normal LNER practice, where electric lighting was installed small nameplates were provided to accompany it. On 1 January 1948 South Bank became part of nationalised British Railways North Eastern Region (NE). Diesel multiple units took over the Darlington – Middlesbrough – Saltburn services from 19 August 1957. By 1955 the station had BR(NE) vitreous enamel tangerine information signs installed, with double-sided nameboards near each end of the island platform. Whilst Cargo Fleet and Grangetown stations had totem name signs installed at this time the LNER nameplates at South Bank were considered adequate and remained in place until the early 1970s. In summer 1961 the off-peak train frequency was still half-hourly, and 39 called on Monday to Friday, 38 on Saturdays and 40 on Sundays in the down direction; 41 called on Monday to Friday, 42 on Saturdays and 34 on Sundays in the opposite direction. The frequent service on Sundays reflected the popularity of Redcar, Marske and Saltburn for day trips. Up trains in summer 1961 included one steam-hauled service towards London (Kings Cross) on Monday to Friday, and three such services on Saturdays, but there were no services from London. In May 1974 the train service was reduced, with off-peak stops only hourly, resulting in only 25 down and 27 up weekday calls, and 20 in each direction on Sundays. British Railways had been rebranded as British Rail in January 1965, and in January 1967 the North Eastern Region was absorbed into the Eastern Region (ER). This region swiftly effected economies on many of its routes by de-staffing stations and introducing ‘Pay Trains’ on which conductor-guards issued tickets. 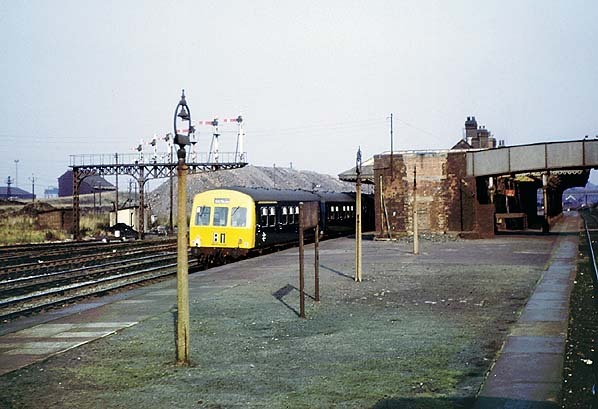 On 4 May 1969 the Darlington – Middlesbrough - Saltburn line was converted to Pay Train operation, and South Bank was one of the stations to be reduced to what were popularly known as ‘unstaffed halts’ – though the ER had discontinued the use of ‘Halt’ in 1968, and the NE had never been keen on the term. No longer attended by staff, the stations were inevitably attractive to vandals. In early 1973 the building and awnings at South Bank were still standing, and some of the lights still worked, but the station was a melancholy sight. 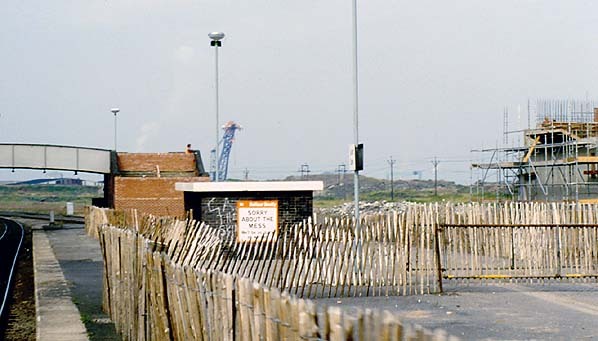 The date of the demolition of the buildings is not known, but by the late 1970s the substantial island platform had only a brick waiting shelter, lamps and Corporate Identity name signs. removed, leaving only the two tracks for the passenger trains and the much reduced freight traffic. On 23 July 1984 British Rail replaced South Bank (2nd) station with a new facility 700yd east, close to a new ASDA store and to some surviving industry. 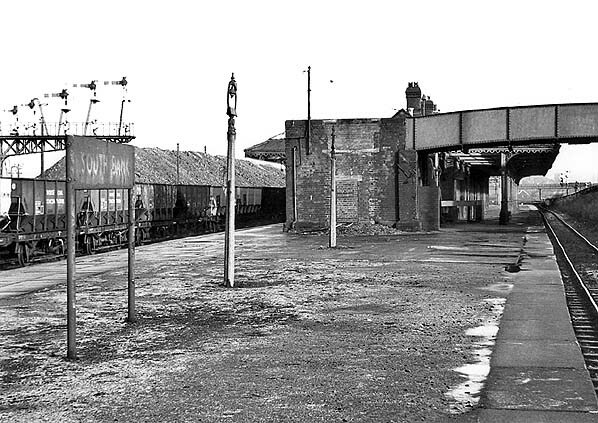 The platform of the closed station remained in situ for many years, finally being erased when the down track was slewed across the platform site. 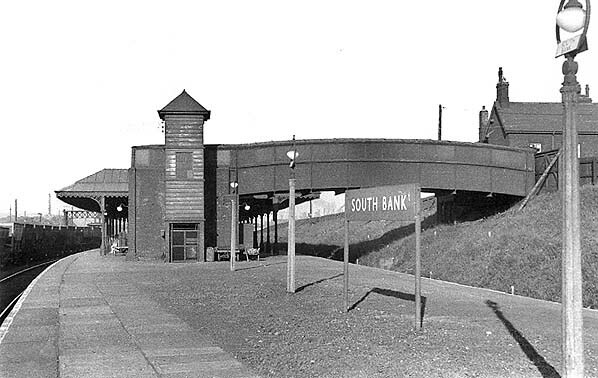 Goods facilities were provided at South Bank, south of the running lines to the east of the passenger station, entered from the Redcar direction. To the north of the single-road goods shed were three sidings, including a 5-ton crane, and there was a further siding adjacent to the cattle pens, south of the goods shed. In 1913 the principal freight handled was pig iron, rails, iron and steel, bars, joists and girders, and roadstone. The goods facilities closed on 2 October 1972. South Bank is a little over two miles east of Middlesbrough on the railway to Redcar and Saltburn. At least three sites on this route have been occupied by stations known as South Bank. Although now a large town of over 140,000 inhabitants, Middlesbrough was a late arrival on the urban map of Britain. For centuries Stockton was the lowest bridging point and principal port close to the mouth of the River Tees. In 1811 Middlesbrough was little more than a hamlet, with 35 inhabitants, and by 1831 the figure was still only 154. The foundation of the town was prompted by opening of the Stockton & Darlington Railway (SDR) in 1825, the pioneering passenger and mineral line whose primary function was to carry coal from central and western County Durham to tidal water for export. At first Stockton was expected to suffice as the coal port, but it was soon evident that larger facilities closer to the sea were needed. Joseph Pease, a prominent figure in the Stockton & Darlington Railway and a member of the influential Quaker banking family, sailed up the Tees in 1828 seeking a site for new coal staiths. He persuaded the management of the S&D to extend the railway eastwards from Stockton, and by 1830 it reached the new staiths close to Middlesbrough Farm (almost directly north of the present Middlesbrough station). There was some debate about what to call this new port, which was at first known as Port Darlington; other options were Linthorpe, Leventhorpe, Acklam and Middlesbrough. A group of speculators, including Pease, set up the Owners of Middlesbrough Estate, and purchased 527 acres for the construction of a new town to service the port, on a site described by a contemporary reporter as ‘a dismal swamp’. From the 1840s ironworks were established close to Middlesbrough, and the discovery of good quality ironstone in the Cleveland Hills near Eston several miles south-east of the town, prompted the rapid expansion of the industry along the southern bank of the Tees; a branch line from the Eston mines contributed traffic to the line through South Bank. In 1862 the Chancellor (later Prime Minister) Gladstone recognised Middlesbrough’s huge potential when he described the growing town as an ‘Infant Hercules’. By the 1880s there was an ironmasters’ district with a complex of furnaces, rolling mills, sheet mills, foundries, wire mills, coke ovens and concrete works served by an extensive and intricate network of railways. When steel supplemented iron production the local Cleveland ore was found unsuitable, so ore was imported from abroad, and this required additional docks and sidings. South Bank was in the midst of this industrial zone. 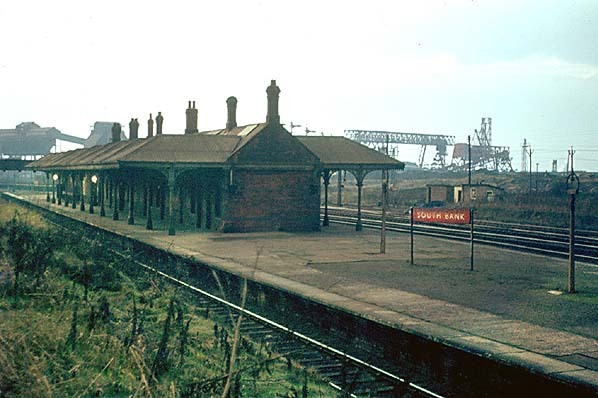 By the 1920s several miles of the southern shore of the Tees adjoining the Middlesbrough to Redcar line, on which South Bank station was situated, were lined with industry. Since WWI iron and steel had been joined by chemicals, originally at Billingham on the Durham (north) bank, but in the following decades oil refining and petrochemicals were added to the mix, and the Wilton plant, producing synthetic textiles, sprawled across an extensive site south of the railway several miles east of South Bank. This busy industrial region continued to grow in the 1960s as tidal mud banks of the Tees estuary were reclaimed for new factories and docks, and the author’s recollection of his first train journey between Middlesbrough and Redcar in 1963 was of a tormented landscape swathed in smoke and steam, a nauseous smell of sulphur, and huge expanses of sidings where steam locos were hauling and shunting rakes of wagons. Whilst de-industrialisation set in elsewhere by the 1970s, Teesside’s heavy industries battled on, and their thirst for water was a principal reason for damming the North Tyne, seventy miles away, to create Kielder Water reservoir (which inundated part of the former Border Counties Railway at Plashetts). In 1979 Britain’s last integrated steel mill - including Europe’s largest blast furnace - opened at the mouth of the Tees near Redcar. This necessitated the diversion of a stretch of the Middlesbrough – Redcar Railway and the construction of yet another complex of sidings. However, even as the new steel mill was under construction, Teesside was following the rest of the heavy industrial regions into rapid decline, and in the 1980s-90s many of the factories were abandoned. The scenes of dereliction along the railway route were as ugly as they were distressing. From the early 1990s, as work progressed to transform the Tees estuary from its grossly polluted state, reclamation was carried out of the derelict industrial land; a ‘flagship’ development on a brownfield site is the Riverside Stadium, home of Middlesbrough FC, which opened in 1995. However, much of the land adjoining the southern shore of the Tees remains bleak with industrial sites scattered around the open spaces which are still waiting to be used. The recent recession has hit Teesside badly, and the prospects for further developments to improve the economy and aesthetic appeal of the southern bank of the Tees in the near future look gloomy. The Middlesbrough & Redcar Railway, authorised by an Act of 21 July 1845, opened to passengers on 5 June 1846, but from the outset the line was an important goods route. The first train was hauled by Locomotion No 1. 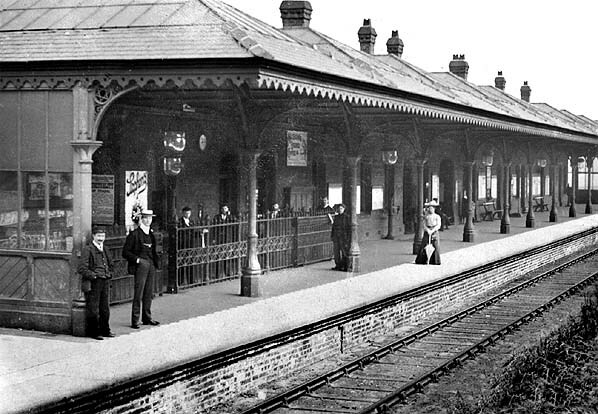 The original Middlesbrough station was replaced with a new facility the following year, and the present station opened in December 1877. The line was leased to the SDR on 1 October 1847 and formally amalgamated with this company on 30 June 1862. In turn, the North Eastern Railway (NER) absorbed the SDR on 13 July 1863. At the eastern end, the original terminus at Redcar was replaced on 19 August 1861when the line was extended to Saltburn. 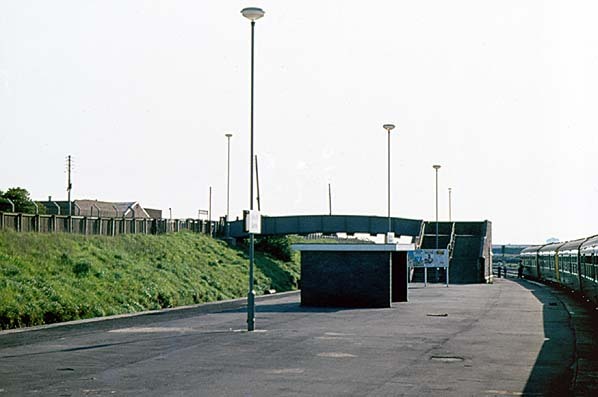 In the late nineteenth century Redcar, Marske and Saltburn developed as holiday resorts, serving as playgrounds for the burgeoning population of Middlesbrough and its conurbation, but they also aspired to attract visitors from further afield. were changed and even exchanged between stations: South Bank was one such location. In 1861 a mineral line opened from Normanby Jetty on the Tees, a short distance north-west of South Bank to Normanby mines and beyond, with a link built from the Middlesbrough – Redcar line in 1865. On 1 January 1902 a passenger service was introduced on this line from Middlesbrough to a new terminus at Eston; this branch was remarkable in having no intermediate stations in the three miles between Cargo Fleet Junction and Eston. The passenger service to Eston lasted only until 11 March 1929, a casualty of motor bus competition. Hatherley, Owen A new kind of bleak: journeys through urban Britain (Verso 2012) Chapter 2 reviews the post-industrial landscape and architecture of Teesside. 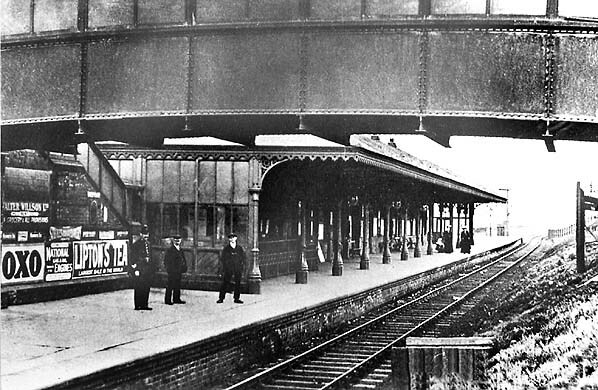 The south (up) face of the island platform of South Bank station, looking north-east c1904. The hipped ridge-and-furrow awning is shown clearly, as is the end-screen of wood and glass; this was a common feature of NER stations, intended to provide passengers with additional protection from the elements. An iron barrier controls access to the platforms. The large globes on the lamps will be noted. 1895 1:2,500 OS map. The relatively new (2nd) South Bank passenger station with its single island platform can be seen together with its goods sidings and shed to the south-east. A row of cottages has been built on the approach road, adjacent to the station. The surroundings are becoming industrialised, with the brick and tile works to the east and a spoil bank developing to the north of the station site; industrial waste would continue to be added over several decades. The south (up) face of the island platform of South Bank station, looking north-east c1905. The covered footbridge is in the foreground, which leads to the staircases down to platform level. As was common practice before World War I, metal advertising signs are very much in evidence, cladding the staircase wall. The covered staircase delivers passengers directly to the booking office, and their comfort in all weathers is assured by the provision of a glazed wooden screen at the west end of the platform roofing. South Bank station, looking east in 1955. The curved, enclosed footbridge gives access to the single island platform from the south. A lift shaft with a slated roof is at the northern end of the footbridge, with the steps out-of-sight beyond it. The substantial glazed roofing, supported by pillars, covers the platforms, but the station buildings cannot be seen from this angle. The lighting and small name signs are of LNER vintage, accompanied by a BR(NE) running-in board. The south (up) face of the island platform at South Bank station in November 1972. The station building and platform roofing are still standing, and the LNER lamps and signs and a BR(NE) running in board are also in place. Cargo Fleet Steel Works can be seen in the background beyond the coal trucks and the signal gantry. 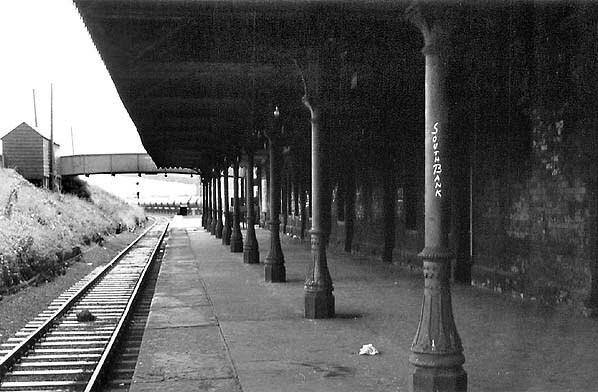 Looking east along the south (up) face of the island platform at South Bank in January 1973. The unstaffed station is shabby and neglected, with glass missing from the awning and graffiti adorning the building. However the ornate brackets supporting the awning can still be appreciated, featuring the NER’s favoured Star of David motif. The absence of a matching bracket on the left side of the nearest pillar is because a screen was formerly provided at the west end of the awning (as seen on the John Alsop c1904 image). The purpose of the new fence on the platform approaching the staircase (extreme left) is not clear. South Bank station seen from the south-east in January 1973. The station building and platform roofing dating from the station’s opening in 1882 are still standing, and the LNER lamps and signs and a BR(NE) running in board are also in place. Cargo Fleet Steel Works can be seen in the background. On 29 May 1978 South Bank station is seen from an eastbound (up) train. The old buildings have been removed, and only the most basic facilities are now supplied. The waiting shelter, built of brick, is more robust and roomy than the metal-and-glass versions more commonly installed in the 1970s. The use of a few, tall lighting columns is typical of BR Eastern Region practice, although the circular lights are not so common, largely confined to Teesside and the Harrogate line. The retention of a double staircase suggests that the station is expected to handle plenty of passengers. An interesting scene on Friday 20 July 1984, looking west along the up platform face from a passing train (which did not stop). This station officially closed three days later, to be replaced with a station 700yd to the east. Access to the station has apparently been blocked by brick walls across the staircase: how can passengers get in or out? The platform is apparently becoming a demolition site, but at least British Rail admits that the place is a mess! In the background the former steel works’ site is being reclaimed. A recent aerial view looking north over the site of South Bank (2nd) station. The two remaining tracks no longer diverge around the island platform site, the down (northern) one having been re-laid adjacent to the up track. The former site of the platform can still be discerned, as can the area north of the passenger lines previously occupied by sidings. The former Station Road, now known as Old Station Road, crosses the line at approximately the location where the steps led from the footbridge to the station building. 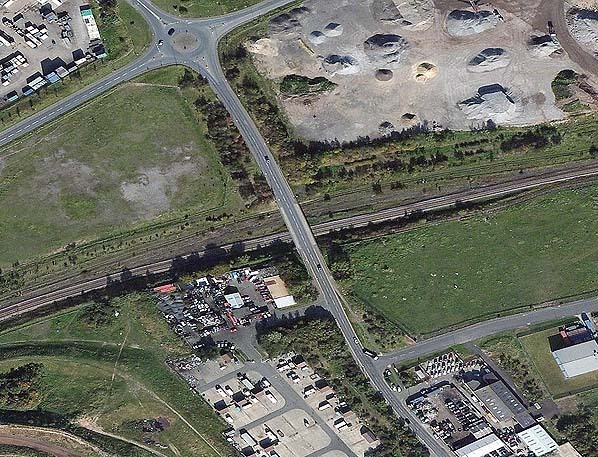 The whole of the site to the north of the railway (upper section of the photograph) was occupied by Cargo Fleet Steel Works until the 1980s.